“Our choice of AcousTech has been rewarded many times. 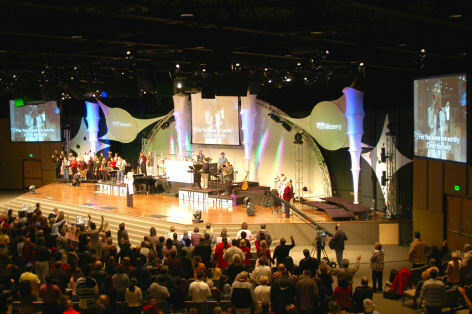 Our project was comprehensive, with installation of a concert level audio system, television lighting, and video projection for a 2,500 seat auditorium. Even though our basic building configuration was in place prior to AcousTech’s (Roland’s) involvement, Roland’s (his) acoustical design and treatment recommendations along with the audio system design resulted in a building that is responsive, yet properly controlled. We’ve enjoyed great sound since we moved into our new building. A large part of our ministry is television so proper lighting was critical. We have very even illumination, which makes the program look great for broadcast and for projection. The video images are superb even with full stage lighting in operation. Each of our goals for the new systems were met and exceeded.